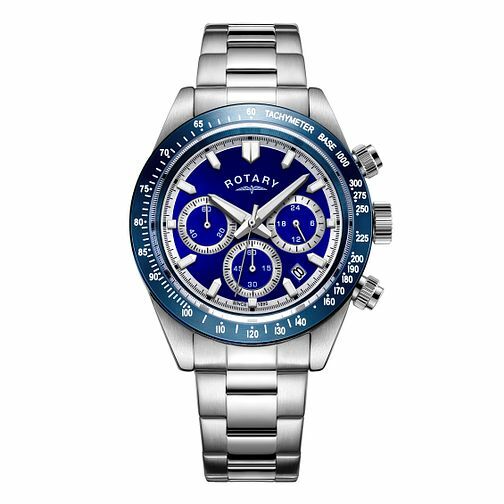 This exclusive Rotary men's stainless steel chronograph watch features a blue dial with timing function sub dials and a date window at 5 o'clock. 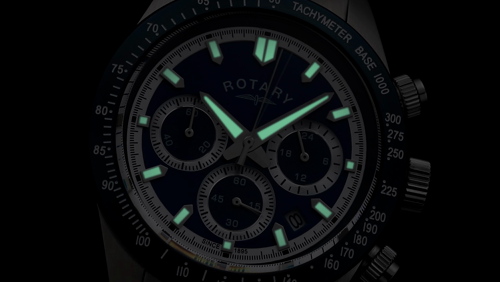 The distinctive blue metal bezel features tachymeter functionality, adding a unique charm and sophistication to this timepiece. Rotary Men's Stainless Steel Bracelet Chronograph Watch is rated 5.0 out of 5 by 1. Rated 5 out of 5 by Anonymous from Quality Rotary timepiece Purchased this Rotary watch as a gift for my son who loves it. As expected a great quality product that will last him for years to come. Took the watch to a local H Samual store to have the bracelet adjusted with no resistance from staff.